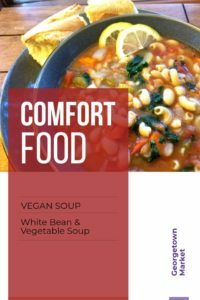 This white bean and vegetable soup is perfect for those cool evenings coming up on the horizon. It’s a great way to kick-off the cooler weather and is sure to be a favorite or carnivores and vegetarians alike! Plus, the preparation and cook time will come in less than an hour! Does it get any better than that?! Remove the soup from the heat now, add your lemon juice, salt and pepper to taste and serve!